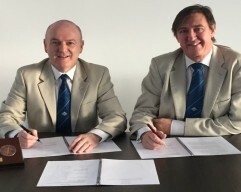 Following the recent announcement that Gibraltar will host the 2019 Island Games I can now confirm that the Games Master Contract has been signed by the Gibraltar Island Games Association (GIGA) and the International Island Games Association (IIGA). The Contract was initially signed by Linda Alvarez, President of GIGA; Reagan Lima, Vice Chairman of the Gibraltar Island Games Organising Committee and Ernest Gomez, Chief Secretary, Her Majesty’s Government of Gibraltar. It was then sent to the Shetland Islands where it was signed on Sunday 22 November 2015 by IIGA Vice Chairman James Johnston and Chairman Jorgen Pettersson. “We are pleased to have finalised the next stage in the planning for the 2019 Games and now for the second time Gibraltar will become a Host of the Games. Gibraltar is a founder member of our Association and has shown determination and responsibility in coming forward as future hosts “, James Johnston commented. “There is a genuine and inspirational interest in sport in Gibraltar and I am sure this will help create a successful Games in 2019”.